Low-grade systemic inflammation and adipose tissue inflammatory macrophages are frequently detected in patients with obesity and type 2 diabetes. Whether inflammatory macrophages also increase in skeletal muscle of individuals with metabolic disorders remains controversial. Here, we assess whether macrophage polarisation markers in skeletal muscle of humans correlate with insulin sensitivity in obesity and type 2 diabetes. Skeletal muscle biopsies were obtained from individuals of normal weight and with normal glucose tolerance (NGT), and overweight/obese individuals with or without type 2 diabetes. Insulin sensitivity was determined by euglycaemic–hyperinsulinaemic clamps. Expression of macrophage genes was analysed by quantitative RT-PCR. 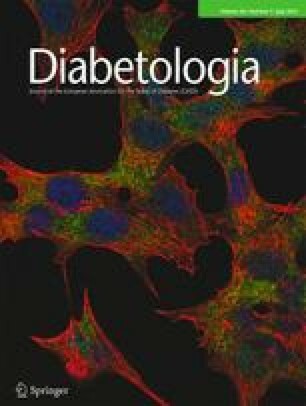 Gene expression of the inflammatory macrophage phenotype marker cluster of differentiation (CD)11c was higher in muscle of type 2 diabetes patients (p = 0.0069), and correlated with HbA1c (p = 0.0139, ρ = 0.48) and fasting plasma glucose (p = 0.0284, ρ = 0.43), but not after correction for age. Expression of TGFB1, encoding the anti-inflammatory marker TGF-β1, correlated inversely with HbA1c (p = 0.0095, ρ = −0.50; p = 0.0484, ρ = −0.50) and fasting plasma glucose (p = 0.0471, ρ = −0.39; p = 0.0374, ρ = −0.52) in two cohorts, as did HbA1c with gene expression of macrophage galactose-binding lectin (MGL) (p = 0.0425, ρ = −0.51). TGFB1 expression was higher in NGT individuals than in individuals with type 2 diabetes (p = 0.0303), and correlated with low fasting plasma insulin (p = 0.0310, ρ = −0.42). In exercised overweight/obese individuals, expression of genes for three anti-inflammatory macrophage markers, MGL (p = 0.0031, ρ = 0.71), CD163 (p = 0.0268, ρ = 0.57) and mannose receptor (p = 0.0125, ρ = 0.63), correlated with high glucose-disposal rate. Muscle expression of macrophage genes reveals a link between inflammatory macrophage markers, age and high glycaemia, whereas anti-inflammatory markers correlate with low glycaemia and high glucose-disposal rate. In humans, obesity increases the risk of developing type 2 diabetes. Inflammatory cells, particularly macrophages in visceral adipose tissue, have been implicated in the progression of obesity to type 2 diabetes . Skeletal muscle is the primary site of dietary glucose disposal in humans, and muscle insulin resistance is essential for whole-body insulin resistance . Numerous studies support the concept that skeletal muscle cells (fibres) develop insulin resistance as a result of the lipotoxic environment on high fat-feeding and obesity . In vitro, muscle cells exposed to saturated fatty acids develop insulin resistance and mount a cell-autonomous inflammatory response . On the other hand, there is evidence that, in vivo, muscle insulin resistance is reactive to factors emanating from adipose and hepatic tissues, in particular adipose tissue macrophage infiltration . However, a third possible scenario remains untested, namely that macrophages with inflammatory signatures increase within skeletal muscle beds and contribute locally to muscle insulin resistance. Muscle-infiltrating macrophages in obesity might affect muscle glucose metabolism via secreted factors that impair glucose homeostasis. Although the rise in human muscle inflammatory genes in obesity and type 2 diabetes correlates with insulin resistance , evidence for elevated immune cells in human muscle in obesity and type 2 diabetes is scant and controversial [6, 7]. Moreover, the phenotypic polarisation of muscle macrophages in obesity and type 2 diabetes is unknown, as is any possible correlation to metabolic status. Here, we assess the expression of genes reflecting different macrophage phenotypes in human muscle biopsies and establish correlations with whole-body insulin action. All studies were approved by the Ethics Committee of the University of Leipzig, Germany, and all participants gave written informed consent. Individuals in cohorts I and II were divided into those with normal glucose tolerance (NGT) and those with type 2 diabetes on the basis of a 75 g oral glucose tolerance test according to American Diabetes Association criteria: participants with NGT had fasting plasma glucose (FPG) <6.0 mmol/l and 120 min plasma glucose <7.8 mmol/l; those with type 2 diabetes had FPG ≥6.0 mmol/l and/or 120 min plasma glucose >11.1 mmol/l. Cohort III comprised individuals with or without previous type 2 diabetes diagnosis and metformin requirement, who underwent a documented 12 month exercise programme: 60 min aerobic training twice weekly (20 min warming and cool down, 20 min running or cycling and 20 min resistance training) plus 60 min swimming once weekly. Insulin sensitivity and glucose disposal were assessed by euglycaemic–hyperinsulinaemic clamps. Skeletal muscle and blood samples were collected 8–10 h after an overnight fast. Plasma was analysed for glucose, insulin, HbA1c and C-reactive protein. Vastus lateralis muscle biopsies (<100 mg) were obtained under local anaesthesia and immediately snap frozen in liquid nitrogen. Frozen muscle tissue was homogenised in Trizol, RNA isolated (RNeasy Mini kit, Qiagen, Mississauga, ON, Canada) and cDNA generated (SuperScript VILO cDNA Synthesis Kit, Life Technologies, Burlington, ON, Canada). Quantitative PCR was performed with Gene Expression master mix (Life Technologies) using a 7900HT Fast Real-Time PCR System (Life Technologies). Specific gene expression was measured with the following Taqman assays in all samples (Life Technologies): ITGAM, encoding cluster of differentiation (CD)11b (Hs00355885_m1); ITGAX, encoding CD11c (Hs01015064_m1); CD163 (Hs00174705_m1); CLEC10A, encoding macrophage galactose-binding lectin (MGL) (Hs00197107_m1); MRC1, encoding mannose receptor (MR) (Hs00267207_m1); TNF encoding TNF-α (Hs00174128_m1); and TGFB1, encoding TGF-β1 (Hs00998133_m1). The cDNA input was 8 ng/reaction. Comparative cycle threshold results were expressed relative to the reference gene Ras-like without CAAX 1 (RIT1, Hs00608424_m1). Gene expression data were analysed by Kruskal–Wallis test and Spearman rank correlation analysis. Pre- and post-exercise data for BMI and glucose-disposal rate (R d) were compared by Wilcoxon matched-pairs signed-rank test. Values of p < 0.05 were considered significant. Only results with significant p values are shown. In cohort I (Table 1), we tested the hypothesis that markers of pro- and anti-inflammatory macrophages in muscle biopsies correlate with metabolic variables in lean and obese NGT individuals, and in type 2 diabetes patients. The expression of the pro-inflammatory macrophage gene ITGAX (encoding CD11c) correlated with FPG (Fig. 1a, p = 0.0284) and HbA1c (Fig. 1b, p = 0.0139). ITGAX was not expressed by cultured human myotubes (data not shown). ITGAX expression tended to correlate inversely with R d (not shown, p = 0.0568) and also to increase with age (not shown, p = 0.0552). When adjusted for age, ITGAX expression no longer correlated significantly with HbA1c (Fig. 1c, p = 0.0933) or FPG (not shown, p = 0.1819). Expression of the anti-inflammatory cytokine TGFB1 (primarily expressed by leucocytes, including macrophages) correlated negatively with FPG (Fig. 1a, p = 0.0095), HbA1c (Fig. 1b, p = 0.0471) and fasting plasma insulin (FPI) (Fig. 1d, p = 0.0310). The association of ITGAX with metabolic disease was substantiated by elevated ITGAX expression in ten patients with type 2 diabetes and BMI >25 kg/m2 compared with eight individuals with NGT and BMI >30 kg/m2 (Fig. 1e, p = 0.0069). However, this difference was not significant after correcting for age (Fig. 1f, p = 0.0542). Expression of ITGAM , encoding the pan-macrophage marker CD11b, was also higher in the type 2 diabetes group (Fig. 1e, p = 0.0094) and did not correlate with age. Hence, we demonstrate that expression of the pro-inflammatory macrophage ‘M1’ marker CD11c correlates positively with the metabolic disturbances in type 2 diabetes. However, the increase in muscle ITGAX expression in type 2 diabetes may be an age-dependent phenomenon (see below). A second, age-matched cohort of individuals was recruited to re-test the hypothesis (cohort II, Table 1). Importantly, ITGAX expression did not differ between NGT and type 2 diabetes; however, similar to cohort I, TGFB1 expression was lower with higher FPG (Fig. 1g, p = 0.0374) and HbA1c (Fig. 1h, p = 0.0484), and tended to correlate positively with R d (not shown, p = 0.0609). To detect ‘M2’-polarised (i.e. non-inflammatory) macrophage markers, we analysed the marker genes CLEC10A (MGL), MRC1 (MR) and CD163. CLEC10A expression was inversely correlated with HbA1c (Fig. 1h, p = 0.0425) and tended to correlate negatively with FPG (not shown, p = 0.0639). MRC1 and CD163 expression did not correlate significantly with metabolic variables. TGFB1 expression was significantly reduced in type 2 diabetes patients compared with overweight/obese NGT individuals (Fig. 1i). In this cohort, individuals with NGT and type 2 diabetes differed markedly in FPI levels. Thus, high TGFB1 expression clusters with low FPI. Taken together, TGFB1 expression differed between NGT and type 2 diabetes patients in one cohort and correlated with low HbA1c and FPG in two cohorts, independent of age. This raises the interesting possibility that muscle TGF-β1, although implicated in adipose tissue remodelling and fibrosis in obesity , may also influence blood glucose homeostasis. Finally, muscle biopsies were obtained from 15 individuals with BMI >25 kg/m2 after 1 year of prescribed physical activity (cohort III, Table 1). Exercise had a pronounced beneficial effect on BMI (Fig. 2a, p = 0.0002 for pre-exercise vs post-exercise) and, particularly, R d (Fig. 2b, p = 0.0010). After the exercise regimen, R d in both NGT and type 2 diabetes groups (68.0 and 66.8 μmol kg−1 min−1, respectively) was higher than R d in type 2 diabetes in both other cohorts (41.7–44.2 μmol kg−1 min−1 range) (Table 1). Expression of the anti-inflammatory markers CLEC10A (p = 0.0031), MRC1 (p = 0.0125) and CD163 (p = 0.0268) correlated strongly with R d (Fig. 2c). There were no significant differences in gene expression between individuals with NGT and type 2 diabetes at this endpoint. Hence, expression of the anti-inflammatory ‘M2’ markers MRC1, CLEC10A and CD163 correlated with better insulin sensitivity in this group of overweight/obese people. This might suggest that the phenotype of muscle-resident macrophages and/or of a recruited population may be impacted by exercise intervention. Further studies are required to explore these possibilities. Exercise and weight loss have marked beneficial effects in lowering systemic inflammation markers in the plasma of humans; however, this is not necessarily reflected in the macrophage content within skeletal muscle [6, 9]. Muscle levels of CD68 did not change with a 15 week weight-loss programme in 27 people with a mean initial BMI of 45.8 kg/m2 . Similarly, no differences in net macrophage number or gene expression were observed before and after exercise in patients with type 2 diabetes and BMI ≥30 kg/m2 . Since another study failed to detect weight-loss-dependent alterations in adipose tissue , weight loss may not act oppositely to weight gain or greater weight loss may be necessary to modify macrophage numbers. Although we did not have pre-exercise samples, we found that the anti-inflammatory ‘M2’ macrophage markers CLEC10A, MRC1 and CD163 strongly correlated with muscle insulin sensitivity in exercised people with BMI >25 kg/m2. In summary, we show that pro- and anti-inflammatory macrophage marker genes vary inversely in human muscle, depending on age, glycaemic status and insulin sensitivity. As muscle insulin sensitivity can be affected by some of the same factors as adipocyte insulin action, it is conceivable that the phenotype of the muscle-residing macrophages affects muscle insulin sensitivity. We further show that low expression of CLEC10A and TGFB1 is associated with hyperglycaemia and that low CLEC10A is also associated with low glucose-disposal rate. Optimal polarisation of macrophages may contribute to the amelioration of insulin resistance with routine exercise. The technical assistance of Z. Liu is highly appreciated, and we thank P. Bilan for knowledgeable advice on the study and manuscript (both Cell Biology Program, The Hospital for Sick Children, Toronto, Canada). Patient analysis and sample collection was supported by Deutsche Forschungsgemeinschaft, Clinical Research group ‘Atherobesity’ (KFO152; BL 833/1-1). Biopsy analysis was carried out at The Hospital for Sick Children, supported by Canadian Institutes of Health Research (CIHR) grant 12601 to A. Klip. L. N. Fink was supported by fellowships from the Carlsberg Foundation and Novo Nordisk. S. R. Costford was supported by a Mitacs fellowship. LNF, AS and AK designed the study. LNF, SRC and KLC acquired and analysed gene expression data. AO and MB recruited patients and controls, collected muscle biopsies and analysed metabolic variables. LNF and AK wrote the manuscript. SRC, KLC, AO, MB and AS revised the manuscript. All authors approved the final version.